A custom Happy Birthday plate makes the perfect First Birthday gift! You can choose your colors -- match your child's room, the party theme, or your kitchen. 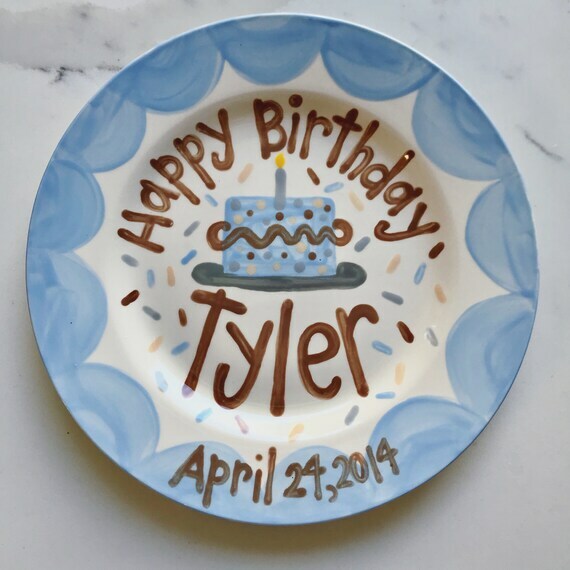 I'll custom paint your whimsical Happy Birthday plate to your specifications, with your child's name -- I can even work with you to match the party's theme! I will also paint the back in a coordinating pattern (stripes, polkadots, etc,) so it can be seen from both sides while on display. On the back, there is room for your custom message to the birthday child, such as "Love Uncle Tim & Aunt Holly", "Happy Birthday, 2018" etc. . . This listing is for a salad sized plate. Convo me if you'd like prices for a dinner-sized plate. Please allow 3-5 days for painting, personalizing and shipping. All my handpainted pottery is non-toxic, fired in my personal kiln, and microwave/dishwasher safe. Little Girls Tea Set - polka dots, cupcakes, pennants & flowers Tea set -- Personalized Little Girl's Tea Set Handpainted. . .